Mazatlan has become one of Mexico's most alluring and inviting beach destinations thanks to its miles of golden beaches and blue lagoons. Mazatlan enjoys year round semi-tropical weather, with average temperatures between 25 and 30 degrees Celsius there's no wonder that it's known as 'Pearl of the Pacific' and fast becoming a popular tourist spot. Mazatlan is home to over 16km of beaches blessed with golden sand and calm waters making them ideal for water sports and swimming, with ample seafood restaurants where you can enjoy the local catch of the day. With over 200 species from around the world this aquarium is a great place to spend the afternoon with the family. You'll get the chance to see turtles, sea lions, sharks, octopus before visiting the crocodile pond and aviary. For the bold and brave there is also a chance to step into the shark tank and swim amongst them. 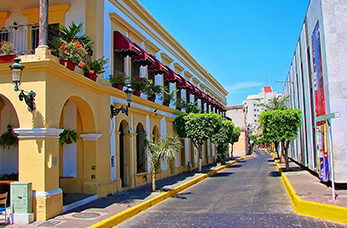 Centro Histotico or "old town" is a charming part of Mazatlan, at it's centre is the catherdral with its yellow twin towers and dramatic interior. Catch a performance at the Teatro Angela Peralta or visit the art galleries, cafes or restaurants on the surrounding streets. Built in 1860, this theatre was reopened in 1992 after being restored for over five years. Visit during November and December and sample some of the Festival Cultural Mazatlan events.